Form of style from boxing trainer Michael Kozlowski works in America too! On April 7and 8, in Madison Square Garden were the 84-th NY Daily News Golden Gloves finals. Four students of boxing trainer Michael Kozlowski were in the finals. Three of them became champions in one of the most prestigious boxing tournament in the USA! On the first day of the finals Jeremy Fiorentino (152 lb,Open) versing Christopher Galeano. One of the first 4 students of Michael Kozlowski stepped on to the ring with an eager face to win. Fiorentino defeated Galeano in the semi-final of New York 2010, but sadly during this fight for some reason Jeremy Fiorentino took the fight to easily, he did not use boxing plan of his coach Michael Kozlowski and in very close fight lost by 4:1 decision. In the last fight of the first day finals, in the ring to go next was coach Mike’s boxer Yegor Plevako (201+ lb,Open) versing 2010 Novice Golden Gloves Champion Elijah Thomas. In the end of the first round after a three punch combination of Iegor Plevako, the referee opened the count. In the second round of the fight after very long, strong punch combinations of Yegor, the referee had to stop the fight. 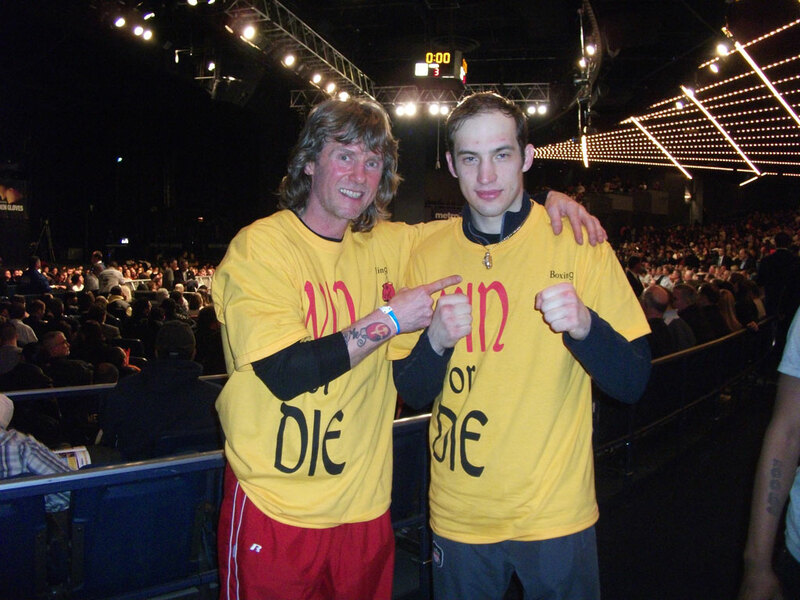 Iegor Plevako representative of WIN or DIE Boxing Club, became 2011 Daily News Golden Gloves Champion ! Boxing trainer Michael "Coach Mike" Kozlowski and his first 2011 Golden Gloves CHAMPION Yegor Plevako. On the next day of the Golden Gloves finals held on Friday April 8th, to the ring came out Michael Kozlowski’s next student, Juan Roman (114 lb,Open). Juan’s opponent was Hamzah Alnuzaili (2010 Novice Golden Gloves Champion). You can tell from the first seconds of the fight Juan Roman was using the strategy of coach Mike and it was working! He won with an unanimous judges decision. Boxing trainer Michael "Coach Mike" Kozlowski and his second 2011 Golden Gloves CHAMPION Juan Roman. The last Golden Gloves finalist of boxing coach Mike was Kamil Abdulshanov (152 lb, Novice) versing Obafemi Bakare. Kamil also faced Obafemi Bakare in the 2010 Novice New York Championship to whom Kamil lost in the finals. But this time Kamil dominated by his technical performance and won the fight! Kamil Abdulshanov did an outstanding job and made a new record for all of the students of Michael Kozlowski, he won all six fights in a row in the same Tournament. 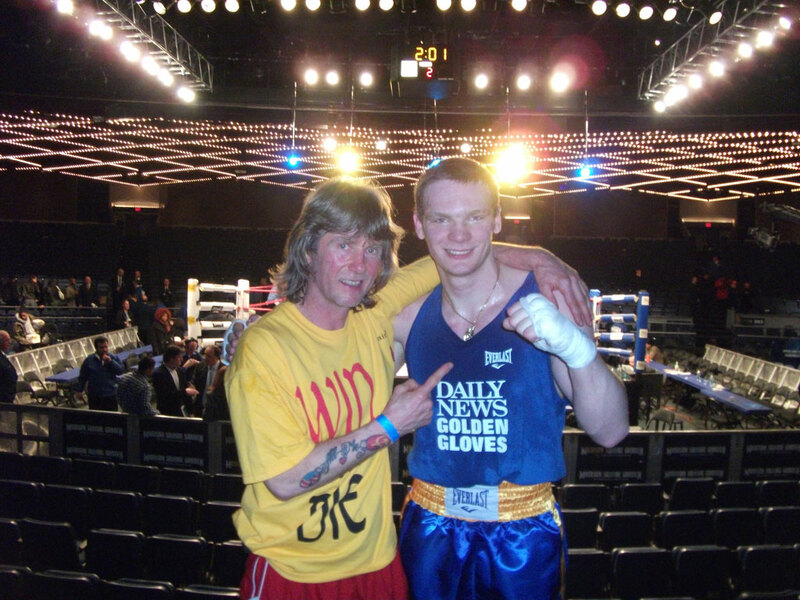 Boxing trainer Michael "Coach Mike" Kozlowski and his third 2011 Golden Gloves CHAMPION Kamil Abdulshanov. P.S. The next day, after the Finals, in the Daily News there was an article about the winners, at the end of the article its said ” SWEET SCIENCE: Ukranian native Iegor Plevako (Win or Die BC), 20, won the Sugar Ray Robinson AWARD for most outstanding open boxer”. I’d be very interested in comparing the boxing style you coach next to what I use. Do you have any video of you teaching hoe to throw a jab or a hook?